The Republic of Iraq’s Ministry of Water Resources has taken delivery of seven 55 tonne Tadano GT-550E-2 truck cranes from the company’s distributor United Iraqi Trading Equipment. 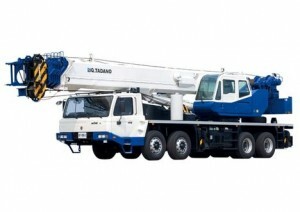 Manufactured by Tadano’s Chinese manufacturing joint venture BQ-Tadano, the four axle GT-550 features a five section 42 metre boom plus a 8.8 to 15.2 metres bi-fold swingaway that takes maximum tip height to 56 metres. Capacity on the fully extended main boom is eight tonne and it can handle 500kg at a radius of 38.1 metres. The cranes have been purchased for various departments within Iraq’s Ministry of Water Resources with three being sent to the General Commission for Operation of Irrigation & Drainage, two to the General Commission for Groundwater, one to the State Commission for Dams & Reservoirs and the final one to the Department of General Estuary.